AlgiPharma has been recognized for its innovative alginate oligomer technology being developed for the treatment of respiratory diseases, and biofilm infections. The award was sponsored and presented by Dr. Richard Thompson from the Development Bank of Wales. Leaders from industry, the NHS, government and academia gathered for the MediWales Innovation Awards, celebrating the year’s biggest achievements in the Welsh life sciences sector. 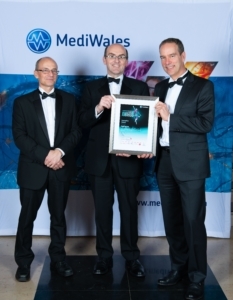 Pictured (Left to right): Robert Thompson from the Development Bank of Wales who presented the award; Prof David Thomas, University of Cardiff; Dr. Philip D. Rye, R&D Director at AlgiPharma. The black tie event was held on 4th December at Cardiff’s National Museum of Wales and delivered with support from BioWales, the Welsh Government’s Healthcare Technology, Strategy & Innovation Team and Health & Care Research Wales. MediWales is the life science network for Wales, with over 200 members including pharmaceutical and health tech companies, NHS health boards, university departments, and professional services and suppliers. MediWales provides advice, support and business opportunities for its members, while promoting collaboration within the life science community in Wales. Every year, MediWales produces a range of publications and organises events including the all Wales NHS conference MediWales Connects, the UK HealthTech conference and the MediWales Innovation Awards.